The best corner feeder on the market! 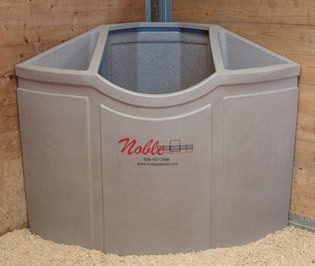 The Noble Corner Feeder is made of specially formulated molded polyurethane that is FDA approved. It is a rotational molded product, meaning it has a seamless construction. The lighter earthtone color of the Noble Feeder does not show as much dirt and grime from daily use as darker colored feeders. The color also gives the feeder a brighter interior which horses seem to prefer (horses do not like to put their heads in a black hole). It is designed to bolt into the corner of a stall or paddock. 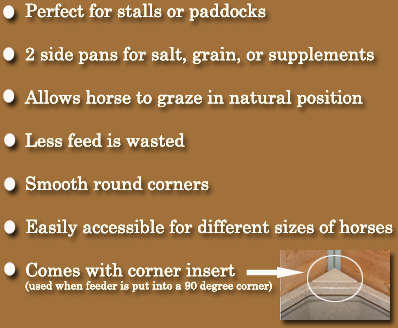 The unique shape of this feeder allows your horse to feed with its head at ground level, a NATURAL GRAZING POSITION. 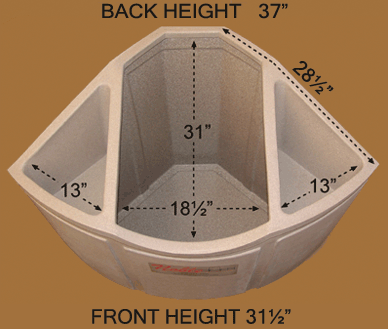 The front of the feeder is lowered with a "yoke" style design that allows easier access for different sizes of horses. The two handy side pans feature rounded inside corners so salt, grain, and minerals are more accessible. These pans measure 13" wide in front and the depth tapers from 9" in front to 14" in back of grain pan. "The corner feeders have all but stopped any waste of hay. And cut stall cleaning time in half. They'll pay for themselves in no time! Thanks, we love them!" Copyright © 2009 Noble Panels & Gates, Inc..